No soft drink has ever excited me as much as an alcoholic tipple (yeah, yeah...lush). I hate fizzy pop and generally stick to water or a Belvoir Pressé, San Pellegrino Lemon, or Bottlegreen drink for guilt-free refreshment. When I was pregnant the worst part was going out to dinner or a bar and being asked what to drink. I just used to look blankly at the waiter and shrug. And the taste! I’ve probably only had three Cocoa-Colas in my whole life, maybe I don't have enough friends to share one with. And I once tried Redbull and couldn't feel my face for half an hour after, not the sort of thing I look for in a drink. As for flavoured waters... bleugh! Zeo are bulldozing into this frankly flat soft drinks arena with a pretty heavyweight marketing plan and budget. They are certainly here to shake things up. I really like the bottles, the fine neck that twists and feels glacial is elegant. These drinks are not pitched to the kids, but adults. Mixologists too are getting a bit excited by them. The main drive is that they are sensory, giving you a little pleasant tingle on the tongue. Amazingly Zeo are 100% natural. I think–with my C in Science GCSE–it's the Stevia sweetener and 32 other botanicals that give you the tingle. The sensation is enough to be interesting without gimmicky. We tried three of the flavours out at the design studio I work at. My preferred one was "Burst" with peach and grapefruit and was quite refreshing. It did have a strange aftertaste - unlike any other drink I could put my finger on. This was more evident in the citrus "Crush" flavour. You know when you drink orange juice after having brushed your teeth? Like that. "Zest" was the most synthetic tasting and was rather medicinal. I can't say I enjoyed that one at all. These weren't for me if I'm being honest. Maybe I'm not much of a soft drink drinker or maybe I need to experience them as part of a cocktail - I imagine them as an interesting backdrop for clean spirits and blended fruits maybe. Intriguing for sure. Visit the Zeo website for more info. 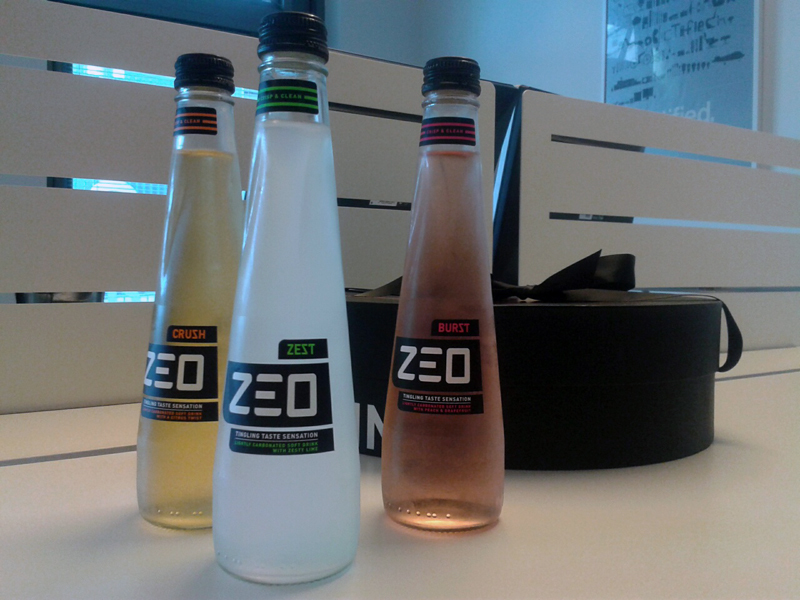 Thanks to Zeo for the samples.